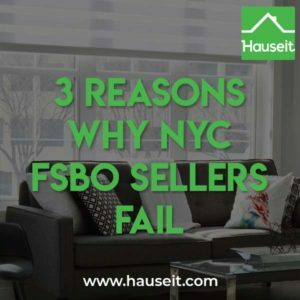 The top 3 reasons why NYC FSBO sellers fail to sell include poor listing syndication, unrealistic pricing and a lack of professional photos and a floor plan. In a slower market with a higher average day count for listings, NYC FSBO sellers are also vulnerable to low confidence and self-doubt. This results in FSBO sellers prematurely delisting their homes without statistically giving the sale enough time to succeed, even when there was nothing wrong with their sale strategy. It’s entirely possible to save up to 6% in commission when selling in NYC by following a simple game plan. These steps include choosing a realistic sale price, taking professional photos, listing on the RLS Broker Database and learning how the sale process works in NYC. The vast majority of NYC FSBO sellers fail because they do not comprehensively advertise their listings on the correct real estate websites and local New York City broker database. Advertising to buyer’s agents by listing in RLS is especially important in NYC since over 75% of the buyer base is represented by buyer brokers. Unfortunately, many NYC FSBO sellers think it’s sufficient to list their home with an unrealistic price and amateur photos on a few free real estate sites like Zillow and ‘see what happens.’ What these sellers fail to understand is that selling real estate in NYC is largely based on momentum and first-impressions. Once you’ve wasted that first impression with bad photos and a fictitious asking price, there’s no going back. This is because every action you take as a seller portrays a story to the market place about the value of your listing and your demeanor as a seller. For example, if you write ‘NO BUYER AGENTS’ in your listing description, have difficulty selling and subsequently realize that most buyers have agents, many buyer agents who have already blacklisted your unit won’t give you a second chance. Similarly, if your initial asking price is laughable, many buyers won’t ever take you seriously, even after you reduce your price. Understandably, many sellers don’t want to advertise to buyer brokers because they want to save the full 6% real estate commission and avoid paying a buyer agent commission altogether. The truth is that refusing to offer a buyer agent commission in NYC will curtail the size of your buyer base by around 75%, and this will reduce the amount of foot traffic, general demand and the number of offers you may receive. Therefore, simply refusing to pay commission without expecting any consequences in terms of reduced demand and a lower sale price is a dangerous and delusional mindset. The truth is that there’s no harm in offering a buyer agent commission and seeing what sorts of offers buyer agents will bring you. You can even leverage this additional demand to generate the catalyst for a bidding war and hopefully an offer or two from direct (unrepresented) buyers. The possible outcomes of poor listing syndication as a seller in NYC include: a lower sale price, failure to sell altogether and/or the gradual loss of confidence to the point that the NYC FSBO seller agrees to a devastating double whammy of financial pain: agreeing to pay 6% in commission to a traditional listing agent while also reducing his or her asking price, making the sale a quick and easy payday for the lucky listing agent who courted you. While it may sound obvious that listing on fewer websites results in less exposure, the damage is far greater than what meets the eye. Having fewer buyers doesn’t just mean that fewer offers are made. It also means that there’s a lower likelihood of a bidding war, meaning that the sale price may not be as high as it could be otherwise. We literally cringe when we hear sellers tell us that they’ve already gotten ‘loads of calls’ just from being listed on one or two websites and therefore don’t feel the need to advertise more comprehensively. Most of these calls are likely from unscrupulous agents without buyers who are simply trying to convert you as a seller client. Many NYC FSBO sellers shockingly have never heard of StreetEasy, the most popular real estate website in NYC, and don’t even bother to list on that site! A home sale is one of the most important financial transactions of a person’s life. When the consequences for poor strategy are so severe, for a NYC FSBO seller to have such little awareness of how the market works is quite disturbing. It just takes one more set of eyes to find a higher offer, an all cash buyer or create a bidding war. 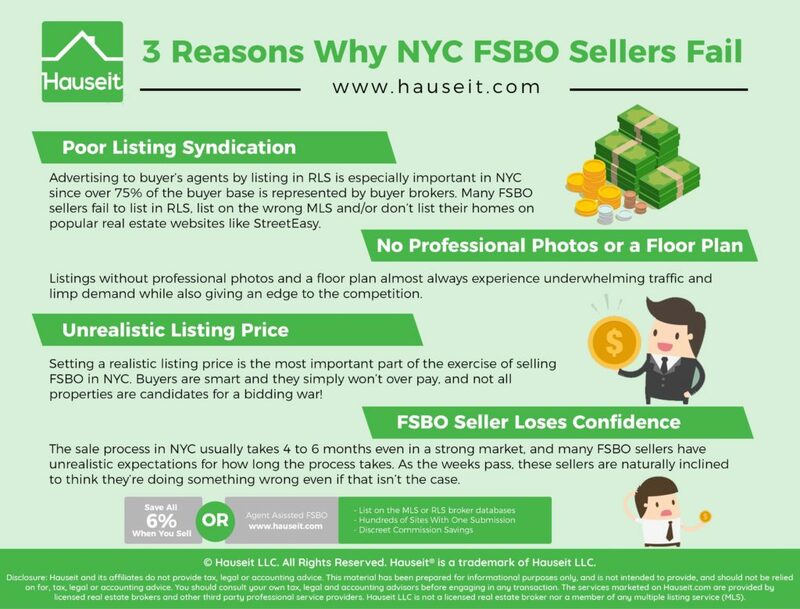 For the low-cost of a NYC Flat-Fee MLS package, it’s shocking to hear that FSBO sellers who will be saving roughly 3-6% in agent commissions aren’t willing to spend a few bucks to list in RLS, where 75% of buyers actually come from! Over 75% of home buyers are represented by buyer’s agents in NYC who primarily use RLS (REBNY Listing Service) to search for and send properties to their buyers. A NYC FSBO seller who is not listed in RLS is effectively ignoring 75% or more of the most serious and qualified buyers. To make matters worse, even if a buyer’s agent happens to stumble upon a NYC FSBO seller’s listing online, he or she likely won’t want to show it to the buyer. Why? Buyer’s agents work for commission only. Therefore, they can’t take any risk of sending their buyer to a FSBO listing and possibly losing out on the commission. Even if you’re willing to pay a buyer agent commission, most brokers won’t be interested in wasting time drafting a one-time showing agreement for you to sign. There are likely plenty of other RLS-listed homes where the commission being offered is already locked-in. Furthermore, FSBO sellers who don’t list on RLS have pretty bad reputations with buyer’s agents. Therefore, most big time buyer’s agents (the ones with real buyers) will steer their clients away from FSBO listings and towards listings offered by full-service, REBNY member listing agents. Listings without professional photos and a floor plan almost always experience underwhelming traffic and limp demand while also giving an edge to the competition. In the case of a missing floor plan, some buyer agents in NYC won’t ever send a listing to a buyer for consideration unless the agent can review a floor plan to make sure the layout works for his or her buyer(s). While most FSBO sellers are understandably on a mission to minimize closing costs as much as possible, one must be pragmatic and realize that there are instances when spending a bit of money on the sale process will actually generate a positive return on investment. Ordering professional photography and a custom floor plan is relatively inexpensive and offers a high return on investment, and that’s one of the reasons why all legitimate listing agents always invest money in professional media. Many prospective sellers who reach out to us are adamant about saving an extra few hundred dollars by saying no to professional photography. Instead, these sellers take amateurish photos of their homes with cell phone cameras. You can see examples of why DIY photography is a bad idea and the benefits of professional photography here. There’s a reason why nearly 100% of agent-managed listings have professional photography. It’s because professional photography is an inexpensive investment which attracts buyers and draws the attention of fellow brokers. For a few hundred dollars, these agents maximize their chances of leaving a strong first impression with buyers, closing deals and getting paid a commission which dwarfs the few hundred dollars invested in professional real estate photography. We regularly see sellers with low quality listing photos who ultimately do not find a buyer on their own. After these FSBO sellers go and hire a listing agent, the property magically reappears with a lower price and brand new listing photos and ends up selling relatively quickly. Why? Photos really do make a huge difference. Instead of spending a few hundred dollars, these FSBO sellers ended up spending tens of thousands of dollars on a 6% listing agent because they lost confidence and ended up hiring an agent out of desperation. As a FSBO seller, you are already saving tens of thousands of dollars by listing without an agent. It simply does not make sense to try and save a little bit more money while running the risk of scaring away buyers, losing momentum and ultimately feeling compelled to hire a listing agent. Setting a realistic listing price is the most important part of the exercise of selling FSBO in NYC. NYC’s real estate market is generally quite robust even during market downturns, however buyers are smart and they simply won’t over pay. Not all apartments or brownstones are candidates for a bidding war, regardless of market conditions. A buyer will not pay more money for your listing when the one around the block or a unit upstairs which recently sold has a lower price per square foot. Your listing’s asking price cannot simply be a function of an emotional desire to make a certain amount of profit or to psychologically sell above a certain asking price. The process of determining your FSBO listing price should be an enjoyable and educational exercise. Between conducting a comparable market analysis, speaking with agents and researching the market, you will learn a tremendous amount about the market as well as how you should position and market your own home. Ultimately, your asking price needs to be in line with comparable listings and recent sales from today’s market if you intend on selling it within the average amount of days it takes for other listings to sell. If the profit or sales price you envision is not in line with the current market, we suggest you either reset your expectations or hold off on selling until your targets are in line with actual market pricing. The sale process in NYC usually takes 4 to 6 months even in a strong market. It is an emotional and arduous journey which is even difficult for many of the most experienced listing agents. Unfortunately, far too many sellers simply assume that their home will sell in two weeks in a bidding war just like what they read about in Sunday’s New York Times article. These unrealistic expectations can turn fatal. As the weeks pass, these sellers are naturally inclined to think they’re doing something wrong even if that isn’t the case. When pricing your home, it’s a good idea to research the average days on market for comparable in your neighborhood so you can set accurate sale timing expectations. Because roughly 75% of buyers are represented by buyers’ agents in NYC, we always suggest that FSBO sellers embrace the co-broking model and incentivize agents to find you buyers. There’s never any obligation to accept an offer brought to you by an agent. Boxing out buyer agents will simply make it harder for you to generate demand. However, we do on occasion encounter buyers’ agents who abuse the co-broke model and use their ‘buyer outreach’ as a covert way to catch you off guard and pitch you their full 6% listing agent service. These agents may discover that your listing is an Agent Assisted FSBO by meeting you at an open house or by having contacted you before you used a flat-fee MLS listing service. These predatory NYC agents will reach out to you on the premise of having a ‘buyer’ and request to view/show your listing. In reality, these agents do not have a buyer. They are simply attempting to corner you and use the private ‘showing’ as an opportunity to pitch you to hire them as a listing agent for 6%. We suggest that you avoid being cornered by these agents at all costs. Meeting with them in private is an opportunity for them to inundate you with false information about why our listing hasn’t sold and lower your self-confidence to the point where you may actually consider hiring them as a listing agent and paying 6% commission. In addition to being ethically questionable, the solicitation of property owners who are already under an exclusive listing (even with a flat-fee listing service) by other real estate salespeople/brokers is actually against the official rules of the Real Estate Board of New York. B. May enter into a separate agreement, such as an Exclusive Listing to lease the Exclusive Property, with the Owner concerning the Exclusive Property where (i) that agreement (the “Second Agreement”) covers matters which are not covered by the Exclusive Listing or (ii) Participant B or his or her firm is specifically requested to do so by the Owner. Before entering into the Second Agreement, Participant B should inform the Owner that by entering into the Second Agreement the Owner could be liable for a commission under both the Exclusive Listing and the Second Agreement. If you believe that a buyers’ agent has fraudulently reached out to you under the guise of having a ‘buyer’ but ends up just pitching you to hire them as a listing agent, we encourage that you submit your complaint in writing to REBNY. 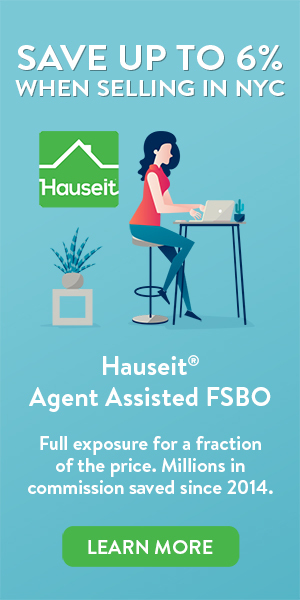 If you’ve signed up for Hauseit’s 1% full service listing option, you will not have to deal at all with any other agents besides your listing agent. This may be your best option if you want to avoid contact with all real estate agents in NYC. If you have chosen to sell your home via an Agent Assisted FSBO listing in NYC where you manage the showings, the amount of broker solicitation you will receive will still be dramatically reduced. This is primarily because you will already have an exclusive listing broker who is a Member Firm of REBNY (Real Estate Board of New York). REBNY has penalties up to $10,000 for violations of its code of conduct, which include the solicitation of the owner client of another Member Firm’s exclusive listing. However, because you will be conducting your own showings you may occasionally be solicited in person by an agent. If this happens, make sure you know how to deal with broker solicitation and are aware of the most common real estate agent lies in NYC. The overall level of solicitation by agents without buyers will be dramatically reduced because you will have the protection of a REBNY Member Firm screening for trollish agent inquiries on your behalf. See below for an actual email exchange between a disingenuous agent and our affiliate listing agent and the seller client. I have called and emailed to get access to this apartment. who should i be speaking with? Eric, nice to hear from you again. You asked a few questions about [address redacted] but we never heard from you when we asked whether you had a buyer! Do you have a buyer for that one still? What is the name of your buyer for this one and what stage of the search are they in? i dont recall inquiring about that apartment. is it STILL on the market? unfortunately i am not allowed to disclose the name of this buyer as i am bound by a NDA i signed. the buyer is in the latter stages of the search and we are considering this listing. we recognize it is “technically” a FSBO and will seek to negotiate accordingly since the owner is saving atleast 2-3% on the commission. Hi Jason – this is a classic example of a troll with no listings, clients and with a history of sending us time wasting emails before. We are almost certain he has no buyer as this would be the first time a real estate agent signed a NDA with a home buyer. Just wanted to check in with you to make sure we have your full support to ignore and screen trolls like this. Thank you! If you’re really weary of having to deal with the false truths emanating from real estate agents in NYC, you may want to read our article on common real estate agent lies in NYC. We will follow your lead. Please ignore and screen as you see fit. I can’t find the email, but I saw a request to show the place on Saturday. I can’t do weekend viewings, at least not on short notice, but would be able to show the apartment during the day next week.